Have you ever been to one of those bachelor parties that got way out of hand? No, we don't mean that time Greg stuck his head out of the limousine moonroof and got hit in the head by a panicked bat. That was just weird, not crazy. We're talking epic night out, someone loses a tooth and gets left on the hotel roof crazy! It's always those nights that seem like they aren't going to amount to much that get a little out of hand. First, it starts out with your buddies overcompensating a little because the soon-to-be-married guest of honor let loose one of the most serious bachelor party faux pas: the subtle yawn! So, the night began to get a little hazy after the shot glasses began to pile up. Then someone suggested going down to Large Marge's Cabaret and even though most of you knew better, you and your adventurous pals found yourself entering this seedy establishment. Everyone knows how it goes down in a place like this, the ladies are kind at heart but they certainly aren't the model types from the Los Vegas strip! They've got some unexpected dance moves and when we say "not in a good way" we're being kind. 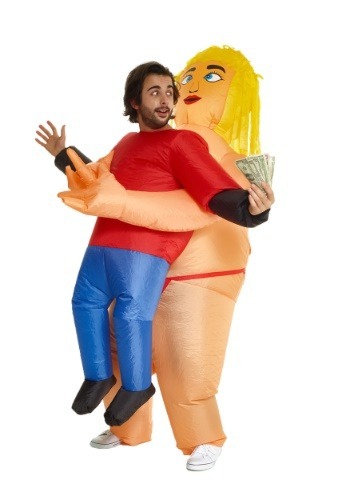 For your next epic costume party, dress to honor that unholy night with this inflatable pick me up stripper outfit. Literally, put yourself in Hilda the exotic dancer's shoes (what kind of stipper wears tennis shoes by the way?) and feel your ego get inflated by the internal fan. You might not ever go back to Large Marge's but now everyone can get a taste of how out of hand that hazy yet unforgettable night was!